LAST GAME (REG. SEASON) 12/2/13: Saints 7 at Seahawks 34. Seattle QB Russell Wilson completes 22 of 30 for 310 yards & 3 TDs for 139.6 rating. Seahawks DE Michael Bennett scores on 22-yard FR-TD. LAST PLAYOFF 1/8/11: Saints 36 at Seahawks 41. Seattle QB Matt Hasselbeck throws 4 TDs, including 2 to TE John Carlson. 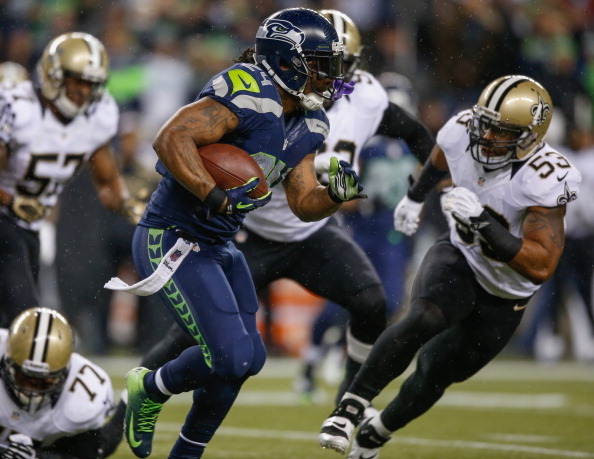 Seahawks RB Marshawn Lynch rushes for 131 yards & TD (67 yards). BROADCAST FOX (1:35 PM PT): Kevin Burkhardt, John Lynch, Erin Andrews (Field reporter). Westwood One: Dave Sims, Mark Malone, Scott Kaplan (Field reporter). SIRIUS: 88 (WW1), 92 (NO), 86 (Sea.). XM: 88 (WW1), 225 (NO), 86 (Sea.). TEAMS MEET for 2nd time in postseason (Sea. 41-36 in 2010 WC). In Week 13, Sea. defeated NO 34-7 on MNF. Seahawks lead all-time series (incl. playoffs) 7-6. SAINTS: Are in playoffs for 5th time under head coach SEAN PAYTON. Club has won 5 of past 7 postseason games, incl. win in SB XLIV…Saints had 5 players selected to Pro Bowl: QB DREW BREES (8th), G JAHRI EVANS (5th), TE JIMMY GRAHAM (2nd), G BEN GRUBBS (2nd) & DE CAMERON JORDAN (1st)…Team ranked 2nd in NFL in pass offense (307.4) & pass defense (194.1) & ranked 4th in NFL in total offense (399.4) & total defense (305.7)…QB Brees was 2nd in NFL in pass yards (5,162), TDs (39), comp. (446) & comp. pct. (68.6). Had 104.7 passer rating, his 4th season with 100+ rating. Brees has 3 consecutive 5,000-yard seasons & 4 overall. There have only been 8 such seasons in NFL history & Brees is only player with multiple 5,000-yard performances. In postseason career, has 102.1 rating, 4th-best mark in NFL history. His 67.0 comp. pct. in postseason is highest mark ever. Brees has 3 400-yard postseason games (incl. 1 vs. Sea. ), most in NFL history. Has 5 300-yard games in playoffs, tied for 5th all-time. Brees has 1.43 INT pct. (6 INTs, 421 att.) in playoffs, 2nd best mark in NFL history…RB MARK INGRAM rushed for 97 yards in WC, 2nd most by Saint in playoff game, & had TD. RB DARREN SPROLES has 7 TDs (4 rush, 3 rec.) in 9 career playoff games. Since 2011 (incl. playoffs), leads NFL RBs with 255 catches, 2,164 rec. yards & 17 rec. TDs. RB PIERRE THOMAS has 4 TDs (2 rush, 2 rec.) in 5 career playoff games. Rookie RB KHIRY ROBINSON averaged 5.6 yards per carry last week (8 att., 45 yards)…TE Graham had 86 catches for 1,215 yards & 16 TDs. Is 1st TE in NFL history with 1,200+ yards & 10+ TDs in 2 different seasons. Graham’s 16 TDs are 2nd most by TE in season. Had 6 100-yard games, tied for most ever in season by TE. Since 2011 (incl. playoffs), leads NFL TEs with 285 catches, 3,709 yards & 39 TDs. 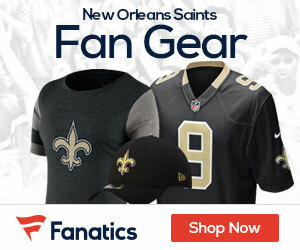 WR MARQUES COLSTON has 47 catches & 644 yards in postseason, both team records. Had 75 catches for 943 yards, his 7th season with 70+ catches & 900+ yards. WR LANCE MOORE had 1st career postseason TD last week (24 yards). Rookie WR KENNY STILLS led NFL with 20.0 avg. (32 catches for 641 yards)…DE Jordan (12.5) & LB JUNIOR GALETTE (12) each set career-highs in sacks. 1st Saints teammates with 12+ sacks each since 2000. Jordan ranked 5th in NFL in sacks & Galette was 6th. Jordan had 1.5 sacks in WC. LB CURTIS LOFTON led team with 125 tackles & LB DAVID HAWTHORNE was 2nd on club with 89 tackles. CB KEENAN LEWIS led team with career-best 4 INTs & was 2nd on club with 11 PD. Since entering NFL in 2006, S ROMAN HARPER leads NFL DBs with 18.5 sacks (incl. playoffs). SEAHAWKS: Are No. 1 seed for 2nd time (2005) since current 12-team format started in 1990. Over past 2 seasons, are 15-1 at home. Have won past 5 postseason home games, outscoring opp. 151-94…Seahawks had 6 players selected to Pro Bowl: S KAM CHANCELLOR (2nd), RB MARSHAWN LYNCH (4th), CB RICHARD SHERMAN (1st), S EARL THOMAS (3rd), C MAX UNGER (2nd) & QB RUSSELL WILSON (2nd)…QB Wilson has 24 wins & 15 home wins in 1st 2 seasons, both are most in SB era. Has 52 pass TDs, 1 of 3 in NFL history with 50+ pass TDs in 1st 2 seasons. Had 101.2 passer rating & is only QB in NFL history to have 100+ rating in both rookie & 2nd season. Is 15-1 with 112.8 rating at home. In 2 career postseason starts, has 102.4 rating. Threw 3 TDs & had 139.6 rating in Week 13…RB Lynch rushed for 1,257 yards & 12 TDs, his 3rd consecutive season with 1,200+ yards & 10+ TDs. Is only NFL player to rush for 1,000+ yards & 10+ TDs in each of past 3 seasons. Since Nov. 2011 (incl. playoffs), leads NFL with 3,966 rush yards & 34 rush TDs. In 4 career playoff games, has 3 rush TDs & 2 100-yard games. Had 131 rush yards & 67-yard TD in 2010 WC. Has 311 rush yards in postseason career, 2nd most in franchise history (SHAUN ALEXANDER, 564)…WR-PR GOLDEN TATE led team with career-high 64 catches & 898 yards. Was only player with 800+ rec. (898) & 500+ PR (585) yards. Had 6 catches for 103 yards & TD in last playoff game. WR DOUG BALDWIN was 2nd on team with 778 rec. yards. Tate, Baldwin & TE ZACH MILLER all tied for team lead with 5 rec. TDs. In last playoff game, Miller had 8 catches for 142 yards & TD. Baldwin, Miller & RB DERRICK COLEMAN each had TD catch in Week 13. WR JERMAINE KEARSE had career-high 4 TDs…Seahawks led NFL with 39 takeaways, 28 INTs & +20 turnover differential. Seattle was 1st in NFL in points allowed (231), total defense (273.6) & pass defense (172)…CB Sherman led NFL with 8 INTs, 1st Seahawk to lead NFL in INTs since 1993 (EUGENE ROBINSON). Has 4 INTs in past 3. Since entering NFL in 2011, Sherman leads NFL with 20 INTs. In past 12 at home, has 9 INTs, 2 TDs (INT & blocked fumble return), FF & FR. S Thomas was 1 of 2 in NFL with 100+ tackles (100), 5+ INTs (5) & 2+ FFs (2). Thomas is only S in past decade to record 100+ tackles, 5+ INTs & 2+ FFs in single season. Aims for 3rd consecutive playoff game with INT. Since 2011, DE CLIFF AVRIL is 1 of 2 in NFL with 25+ sacks (28.5) & 13+ FF (13). Had sack & FF in Week 13 & DE MICHAEL BENNETT returned fumble 22 yards for TD. LBs BOBBY WAGNER (17) & K.J. WRIGHT (16) led team in tackles in 2012 postseason. Wagner led team in 2013 with 119 tackles. S Chancellor had 93 tackles, his 3rd consecutive seasons with 90+ tackles.